The early tether experiments performed during the Gemini flights gave a first indication of how difficult it can be to deploy a tether in space, which has been further confirmed by more recent test flights. Tethers can get twisted and blocked inside their dispensers or go slack, only to give powerful jerks on the spacecraft when suddenly put under tension. But even after successful deployment tethers can move in seemingly mysterious ways. All the different ways in which a space tether can oscillate can be easily simulated using a ball hanging on a length of elastic cord. You can bounce the ball up and down, compressing and stretching the cord. This type of movement is called longitudinal oscillation or spring-mass oscillation. You can also induce a circular, skip-rope motion in the cord, or swing it back and forth in a pendulous motion. Quickly moving the end of the cord up and down in a whipping motion develops transverse oscillations, also known as traveling waves. And with some tension on the cord you can make it vibrate like a huge guitar string. Finally, there is torsion, which is rotation along the length axis of the cord. You can simulate this by winding up the cord and letting go. The ball will rapidly spin up, overshoot the zero-stress point, slow down, and then spin up in the opposite direction and so on until the movement dampens out. Any tether has a number of so-called resonance frequencies at which it "likes" to oscillate in one way or the other. These frequencies depend on the length of the tether, its elasticity, and the tension that is put on it. If the frequency at which a tether is moved due to an external force (like the movement of your hand on the elastic cord of the example) corresponds to one of its resonance frequencies, the movement of the cable can quickly grow in strength. It's a bit like with a basketball, which you can bounce higher and higher off the ground if you find the right rhythm. If disturbing forces on a tether excite it in just the right way, the induced motion may become so violent that it can break the tether. Even if that does not happen, a viciously shaking tether can damage the spacecraft to which it is attached, or make it lose its attitude control. An example of what such "mechanical resonance'' can do is the famous case of the Tacoma Narrows Bridge in the state of Washington, which in 1940 collapsed in only a mild wind that happened to come from just the wrong direction. The destruction of the bridge was recorded on film by Barney Elliott, owner of a local camera shop (you can easily find this movie on the Internet). His footage shows how the steady wind makes the bridge sway side to side; when the left side of the roadway went down, the right side would rise, and vice versa, with the centerline of the road remaining still. The bridge is twisted ever more wildly, until it eventually collapses. The movie is often shown to engineering, architecture and physics students as a cautionary tale. The collapse of the bridge was due to a steady force, the wind, and the bridge acting as a kind of wing. Part of it would lift up due to the wind, then stall and fall back. The periodic movement was exactly matching one of the resonance frequencies of the bridge, so that the movement could grow in magnitude and force until the structure could no longer cope. There is no wind in space, but the bottom part of a space elevator ribbon may very well be susceptible to just this type of wind-induced torsional vibration. To complicate things even further, different types of oscillation may interact with each other if the frequency of one movement closely matches the resonance frequency of another type of movement. For instance, transverse oscillations in a tether may cause the attached deployer satellite to swing back and forth like a pendulum. A potential cause of problems in a space elevator is the climbing vehicles going up and down. They could cause transverse oscillations like those in the example of the elastic cord and ball. Jerome Pearson was the first to study the dynamics of this behavior in a space elevator, and found that there will be certain speeds at which climbers should not be allowed to travel up or down the ribbon. However, unlike with conventional speed limits, going slower or faster than a critical velocity would be okay; it is only the small set of discrete speeds that need to be avoided. Moving at wave-inducing speed for a relatively short time—a few hours—would not be a problem either, so the impact of the fixed speed limits would be small. Electrodynamic propulsion tether spacecraft may experience resonance problems due to the variations in electric power levels when orbiting from the day side to the night side of Earth and vice versa. The resulting periodic changes in propulsion force could cause the tether to swing out of control, depending on its length, mass, and material. Rotating electrodynamic tethers have even more chance of getting into resonance trouble, because as the tether rotates through the magnetic field, the direction of the Lorentz force with respect to the rotation direction changes every half rotation, constantly accelerating and then decelerating the tether. On top of this, the Lorentz force is also higher when the tether rotates in the direction of the orbital velocity than when it rotates in the opposite direction (in the first case the total speed is the orbital plus rotational velocity; in the other case the speed is the orbital minus the rotational velocity). Such periodic changes in the electrodynamic force on the tether can definitely lead to problematic resonance vibrations. 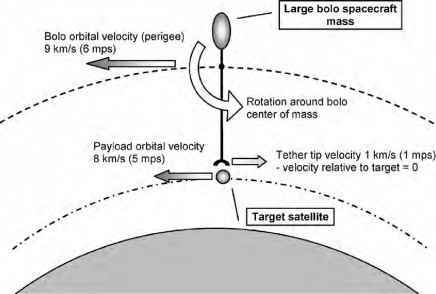 The testing of the deployment and dynamics of tethers tens of kilometers long under microgravity conditions is impossible on Earth. Fortunately, the behavior of tethers can be simulated and predicted with sophisticated computer programs, so that problems can be avoided to a certain extent. For the Young Engineers' Satellite (YES-2) mission (see Satellite Experiments in Chapter 4), a test rig was built that incorporated a deployer system plus a spooling motor to pull on the tether. The motor simulated the gravity gradient forces that in space would pull the tether out of its storage canister; its speed was governed by a computer simulating the deployment velocity that would occur on the real mission. The tension in the tether was continuously monitored, and subsequently used as input for tether dynamics simulations. With this test equipment, the deployment of the 31.7-km-long (19.7-mile-long) space tether could be accurately and inexpensively tested and optimized inside a small laboratory on Earth. To ensure sufficient control, future large-scale tethers will need to be "smart," incorporating sensors, actuators, and control electronics that continuously check what is happening to the tether and correct unwanted movements. The Lorentz forces on electrodynamic tethers can then be actively controlled, by establishing and breaking the electrical circuit at the right moments, so that dangerous oscillation modes are avoided. Dampeners built into a tether or at the anchoring point of a space elevator can also help to avoid vibrations going out of control.